Tailhunter Captain Victor goofs with Gerry Acosta and Victor Gildelmontes who got into the nice bite of football tuna late in the week of Cerralvo Island. The guys got into the bite but ran out’ve beer and came back to shore. Then, they went back out and caught more fish! All the tuna were fun 8-12 pounders, but the first school-sized fish we’ve seen all season. Mario Salazar and Luis Arandia started hooking tuna when this nice sailfish bit while fishing with our Tailhunter Las Arenas Fleet. Attempts to release the sail weren’t successful and the meat was donated. 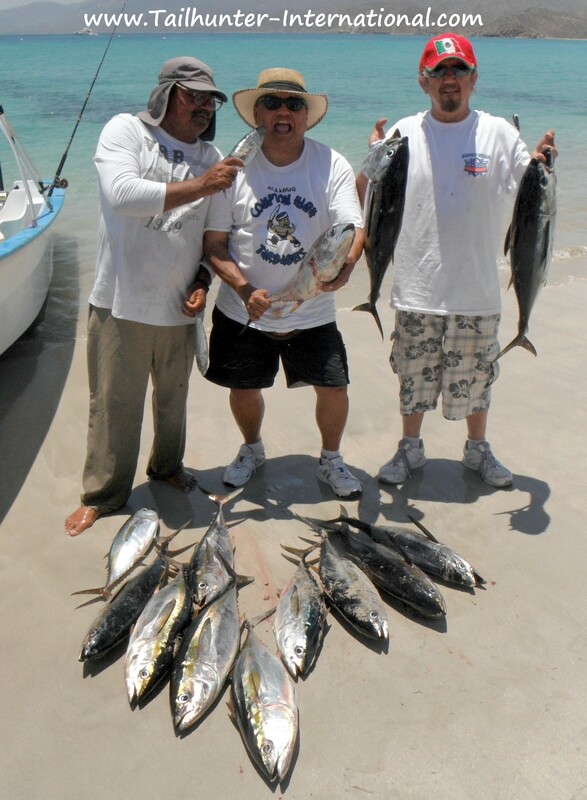 The guys also got some nice dorado while fishing several days with us. Our long time amigo, Victor Ochoa with Captain Jorge. This is one of the great stories. Several years ago, Victor was fishing with us and Capt. Jorge was running the panga. As the day went on, they realized they were COUSINS! Victor’s mother had moved to California but was the cousin to Capt. Jorge’s mother! So, the two guys are related and always fish well together plus have a good time showing off one of their larger dorado of the trip. We have sure had some good fishermen from New Mexico this season! Darren Hanson flew his own plane down and spent several days on the water with us. 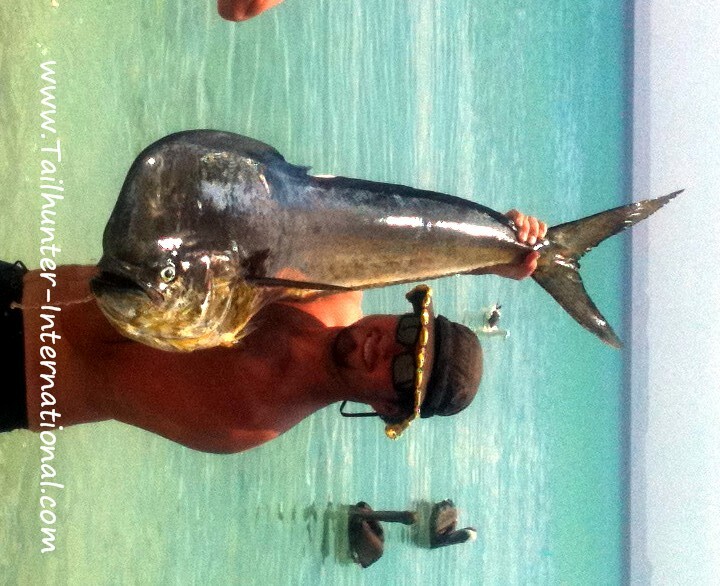 He took this huge bull north of La Paz near Espiritu Santo Island. Our buddy, James “Hawk” Davis, took this incredible shot of Pam Sharp’s marlin doing the dance as it’s close to the panga. You can see her special “pink lure” on the line as the fish does it’s thing. Great shot and Pam also released the big fish. 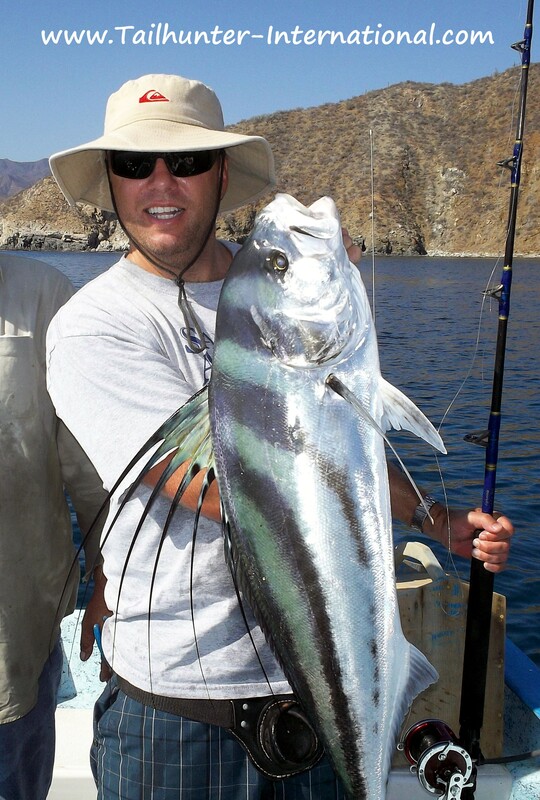 Jim Lipkowski wanted one day to get a shot at getitng a roosterfish and successfully got this nice pez gallo of Las Arenas. Nice buffet…yellowfin tuna…a pargo…even a small mako shark as Captain Archangel with our Tailhunter Las Arenas Fleet poses with Don Slaiman. 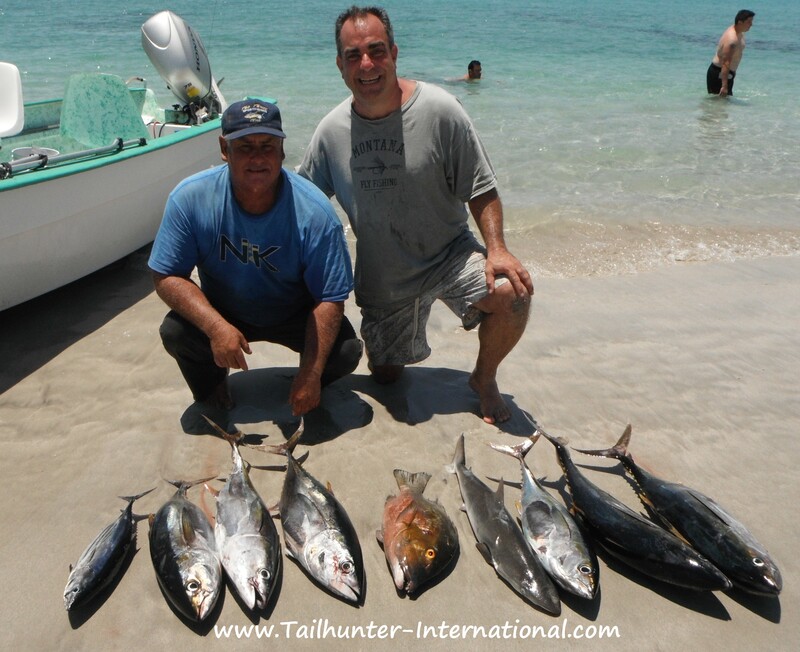 TUNA SHOW UP AT LAS ARENAS WHILE DORADO CONTINUE FULL MOON FEEDING! Despite the full moon, it wasn’t a bad week of fishing at all! The past few months, the full moon has actually been our better fishing. However, while the fishing seemed to slow just a tad, it was still pretty steady enough to fill some ice chests and keep anglers happy. The dorado bite north of La Paz continued. 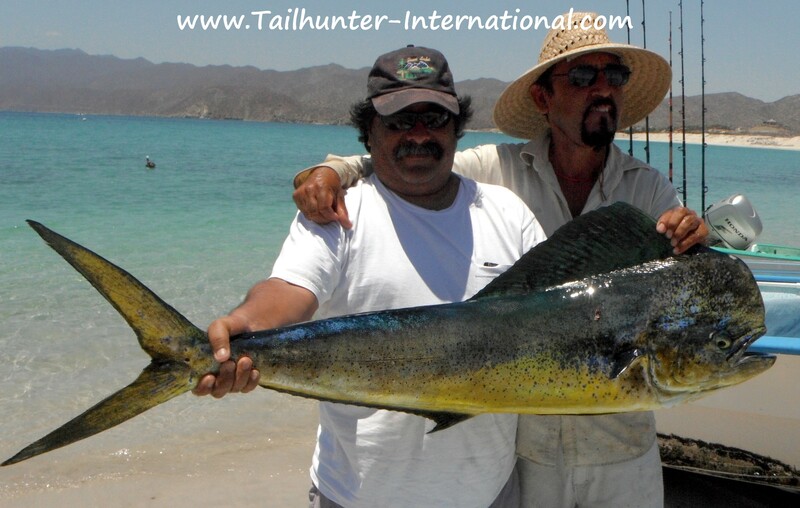 Some days were better than others and some of our pangas did better than others but overall, if you fished a few days, you were going to get some nice limits of dorado that averaged about 15 pounds, but no unusual to have others in the 20-45 pound class as well. As far as I can remember this week, we had a lot of pangas out and I think pretty much everyone had shots at some of the bigger boys. Some of them caught them and some well…got away! That’s why they’re BIG! But there was some great action. The biggest factor seemed to be the wind. Some days were a little breezy and those days made finding the dorado a bit harder. The less wind…the better the dorado bite seemed to be. The nicest surprise was the tuna boil that took place late in the week off Cerralvo Island. In spots between the island and the 88 spot to the east there were some nice boils of tuna going off. Nothing big, but for some pangas all the football sized 8-15 pounders they could handle! At the time of this writing, I don’t know if this is a fluke or the start of some nice tuna shots, but at least at the end of the week things sure looked promising. Some of the commercial guys who were out as far as 25-35 miles said there were some spots of larger fish in the 30-50 pound category. 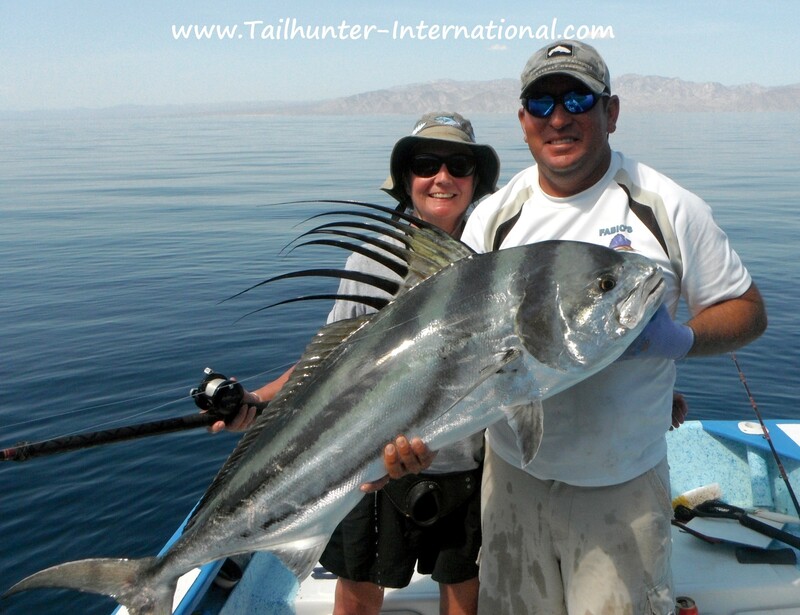 But for our Las Arenas fleet, even if they didn’t fish for tuna, it remains the spot for roosterfish. Boy, did we have some nice roosterfish going this week. Several of the fish were in the 40-65 pound class plus a good number in the 20-30 pound class. It continues to be one of the best roosterfish seasons in a long time. 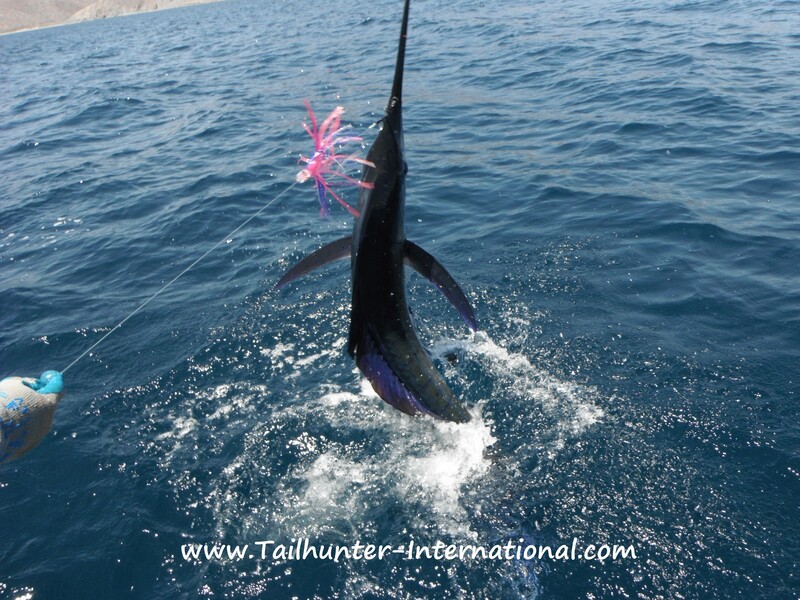 Also, quite few marlin and sailfish around still. 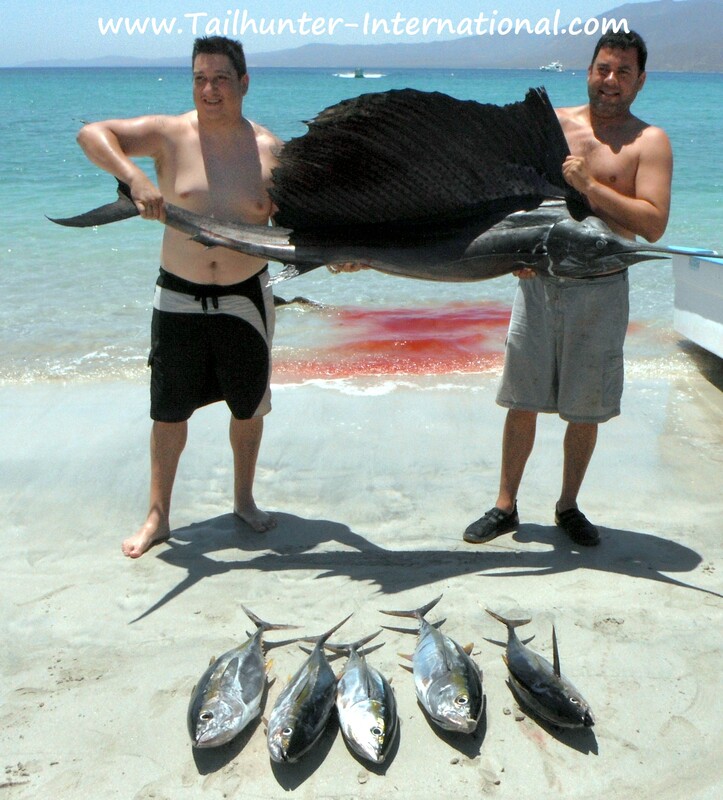 We’re not specifically targeting them, but we hooked a number just while fishing for dorado or other species. Most were released.